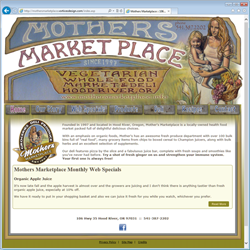 Founded in 1997 and located in Hood River, Oregon, Mother's Marketplace is a locally-owned health food market packed full of delightful delicious choices. With an emphasis on organic foods, Mother's has an awesome fresh produce department with over 100 bulk bins full of "real food", many grocery items from chips to boxed cereal to Champion juicers, along with bulk herbs and an excellent selection of supplements. Design Components: This was a site re-design. 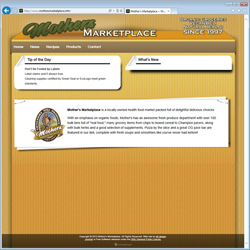 The old site was very outdated and lacking in visual impact. It was also designed to be database driven yet no one was instructed on how to use the update tool so the site was poorly maintained and used over the years. We made greater use of Mother's beautiful logo and existing design material in the site giving it a look and feel that actually reflected their company. Additionally we added in a new recipe section where their customers can submit and share their favorite vegan recipes.